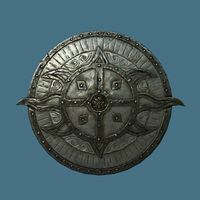 While this shield is equipped, due to its aura effect, NPCs will comment as if you had a Cloak spell on, saying "That spell looks dangerous... keep your distance." This happens even if you're not in combat and just carrying the shield, without activating the aura. Because the magic effect is internally realized as script rather than an enchantment, the shield can be tempered without the Arcane Blacksmith perk. It cannot, however, be further enchanted. The shield's aura may sometimes stop working. Dropping and picking up the shield again seems to fix this.